Malcolm X - 1925-1965 attend à Martin Luther King, conférence de presse, la tête-et-épaules portrait. 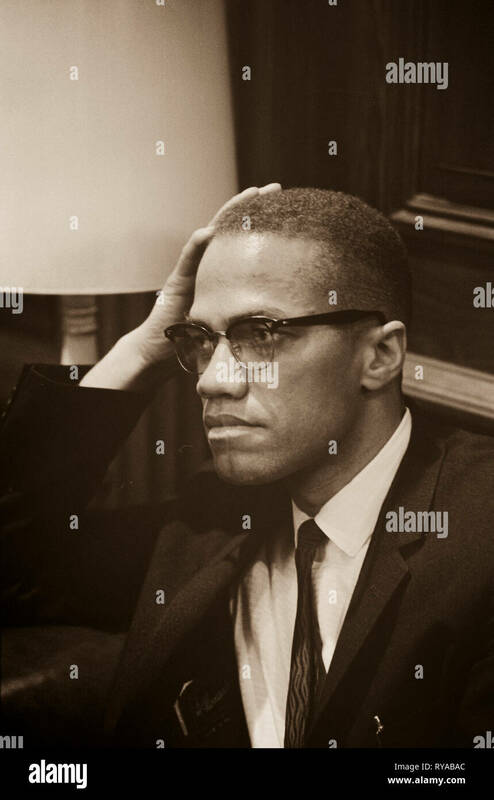 Malcolm X (1925-1965) était un ministre musulman et militant des droits de l'homme qui a été une figure populaire pendant le mouvement des droits civils. Il est surtout connu pour ses activités de plaidoyer pour les droits des noirs ; certains le considèrent comme un homme qui a inculpé l'Amérique blanche dans les conditions les conditions pour ses crimes contre les Américains noirs, tandis que d'autres l'ont accusé de prêcher le racisme et la violence. Malcolm X (1925–1965) was an American Muslim minister and human rights activist who was a popular figure during the civil rights movement. He is best known for his controversial advocacy for the rights of blacks; some consider him a man who indicted white America in the harshest terms for its crimes against black Americans, while others accused him of preaching racism and violence. Born Malcolm Little in Omaha, Nebraska, he relocated to New York City's Harlem neighborhood in 1943, after spending his teenage years in a series of foster homes following his father's murder and his mother's hospitalization. In New York, Malcolm X engaged in several illicit activities, eventually being sentenced to ten years in prison in 1946 for larceny and breaking and entering. In prison, he joined the Nation of Islam (NOI), and quickly became one of the organization's most influential leaders after being paroled in 1952. During the civil rights movement, Malcolm X served as the public face of the controversial group for a dozen years, where he advocated for black supremacy, the separation of black and white Americans, and rejected the notion of the civil rights movement for its emphasis on racial integration. He also expressed pride in some of the social achievements he made with the Nation, particularly its free drug rehabilitation program. In the 1950s, Malcolm X endured surveillance from the Federal Bureau of Investigation (FBI) for the Nation's supposed links to communism. In the 1960s, Malcolm X began to grow disillusioned with the Nation of Islam, and in particular, with its leader Elijah Muhammad. Expressing many regrets about his time with them, which he had come to regard as largely wasted, he instead embraced Sunni Islam. 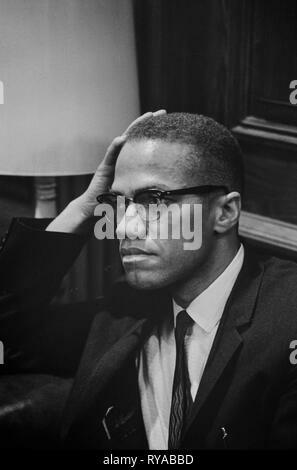 Malcolm X then began to advocate for racial integration and disavowed racism after completing Hajj, whereby he also became known as el-Hajj Malik el-Shabazz. [A] After a brief period of travel across Africa, he notably repudiated the Nation of Islam.